I have been the sole full-time photographer for the newspaper in my community for 26 years. In that time, I’ve seen and photographed a lot. There have been a huge number of stories to be told, on every emotional level. The community has come to know and appreciate me, and I am usually welcome. Even on those occasions when the prying eye of my cameras is not welcome, these people mostly know why I have to be there. I thought of this last night during a moment when my cameras might be seeing more that my subjects might like, the end of the season for the Ada Cougars football team. In the business, we call these photos “dejection art,” and making these pictures requires some skills. The most important of these is to get the picture while staying out of the moment. In addition to capturing all these moments, I’ve gotten to know the people, and by this time in my career, I now know the children of the people I photographed when I came here in 1988. An example is the Jack family. When I started working in Ada, the Cougars were on there way to winning their 14th state championship (they have since won five more), led by a talented running back named Tyler Jack. In 1993, Tyler led Ada’s East Central University Tigers to a national championship. Cheering on the sidelines was Marcy Jeffcoat, who became Tyler’s wife. Tyler became a state trooper, and Marcy now teaches in the Ada City Schools. They have two children, Taryn and Tanner. Taryn started for the Lady Cougars softball team as catcher, and Tanner started this year at center. I’m always glad when I run into any of them, and they are always glad to see me. 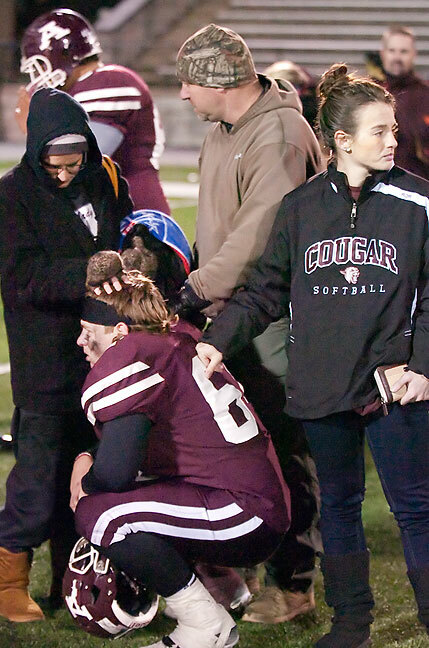 Marcy, Tyler and Taryn comfort Tanner after the Ada Cougars loss to Weatherford in the first round of the playoffs last night at ECU’s Norris Field. Props to sister Jack for touching our defeated hero in just the right way — fist bump to the back, head turned away in respect. Her pose allows him to maintain his dignity while still saying “I got your back, bro, no matter what”. As I do yours. Just sayin’. +1 Nicole. Exactly what I thought.